Away to the south and west thick rolls of cloud covered the hills, clouds that were forecast to reach the Cairngorms and the Monadh Liath hills before the end of the day. Starting late I went for what I thought would be a straightforward walk up Carn an Fhreiceadain above Kingussie, a hill that can be climbed on bulldozed tracks. 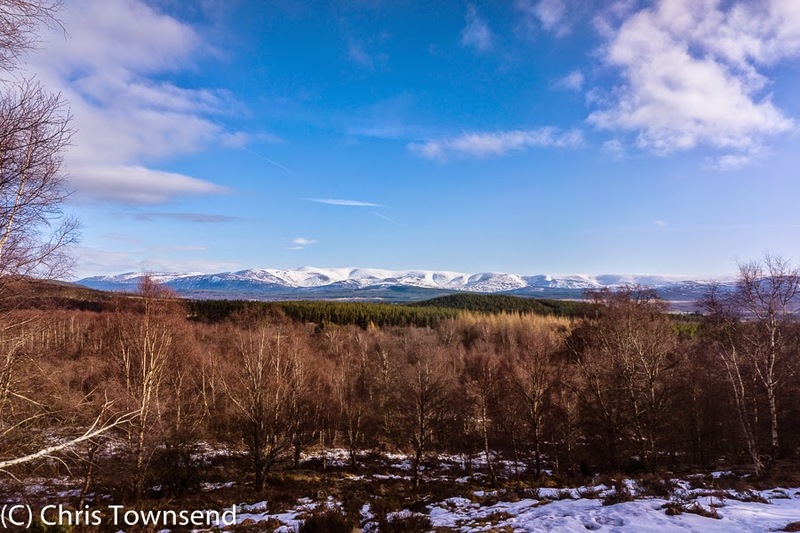 Whilst unprepossessing in itself Carn an Fhreiceadain –the cairn of the watcher – is a splendid viewpoint for the Cairngorms and the vast rolling expanse of the Monadh Liath. It lies on the western edge of the Allt Duine area, site of a proposed wind farm (about which more in a forthcoming post). Sometimes finding a way out of a town and into the hills can be the hardest navigation of the day. Kingussie has a good path network and the track up Carn an Fhreiceadain isn’t hard to find so I wasn’t expecting problems and on the ascent there were none, though I did notice a closed bridge, path relocations and some new hydro construction. 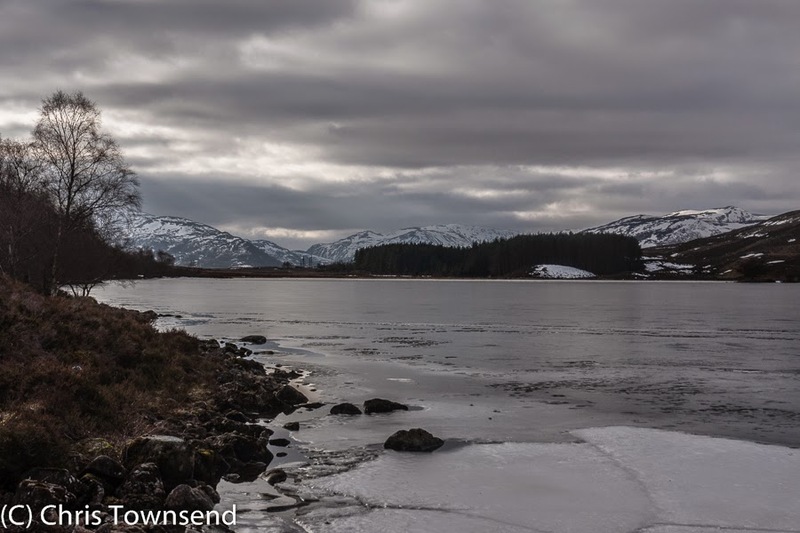 Climbing through lovely old birch woods to frozen Loch Gynack I had wonderful views across Strathspey to the Cairngorms shining white in bright sunshine though the views west along the loch showed dark overcast skies. Those clouds to the south-west were coming closer though and soon the first of them swept high overhead, casting the land into shadow. Once above the trees there was soon enough snow left for me to use my snowshoes. Some of the drifts were deep enough that walking would have been slow and arduous as the snow was soft. Even with the snowshoes progress was quite hard work. I couldn’t use the snowshoes all the time however. I was climbing up long open slopes towards the subsidiary top of Beinn Bhreac and wherever the angle turned the track towards the sun, which was frequently, the snow had gone. The snowshoes came off and went on again many times, slowing me down. The mist was just touching Beinn Bhreac as I approached the summit. Away to the north-east I could see the rapidly fading Allt Duine hills. 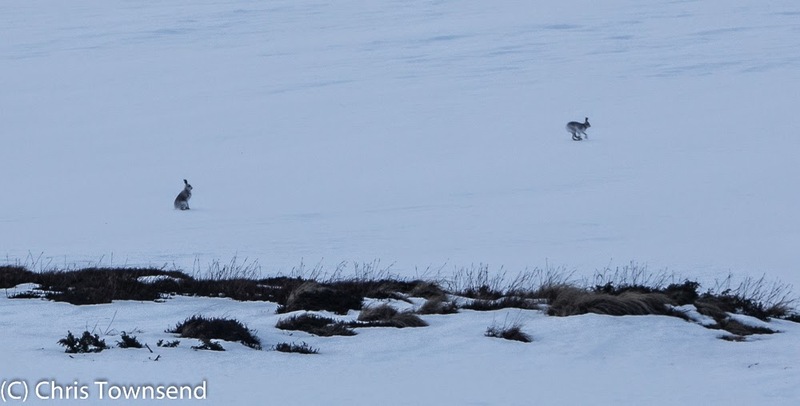 Mountain hares raced across the snowfields, pausing occasionally to glance in my direction, and grouse flew low over the ground, chattering quietly. Otherwise all was quiet and still. From Beinn Bhreac to Carn an Fhreiceadain the mist was thick. If the snow cover had been complete I’d have been in a white-out. As it was I could always see rocks or heather in the distance though the snow in front of me appeared completely featureless. A few times I stumbled when the ground rose or fell unexpectedly. Again my progress was slow. 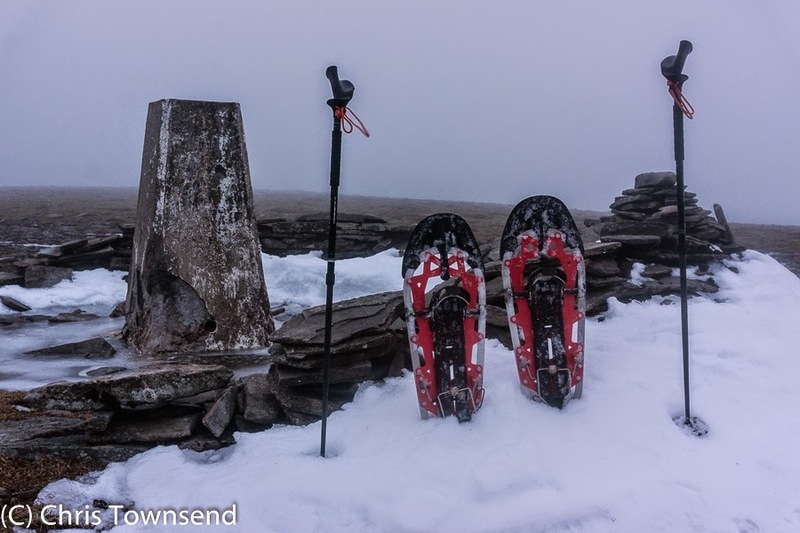 Eventually the summit trig point loomed up, banked by snow but otherwise surrounded by a bare stony plateau. The wind was cold and the time late with sunset not far away. I didn’t linger but was soon descending the track that runs down the Allt Mor glen. Sheltered from the sun the snow here was deeper and unbroken and I was finally able to make good progress on my snowshoes. In places the snow was banked at steep angles across the track and I edged across cautiously, wondering about avalanches. Coming out of the dense cloud I could see tendrils of mist writhing across the glen below me and seeping into the dark trees. By the time I reached the forest it was dark and under the canopy I needed my headlamp. The track was still snowy and I kept the snowshoes on. The mist drifting through the trees meant I couldn’t see far even with the headlamp as the beam bounced back off the thick air. I passed some big earth movers and various signs warning of the hydro work before reaching a cleared area with sheds and machinery. Beyond this the track reached some fancy gates and a private sign. A building with lights on lay not far inside the gates. I’d seen no junctions but knowing I must have missed one I turned back. Casting round the cleared area I found a half-hidden signpost pointing down a now-muddy track through the trees. Off with the snowshoes and then careful walking as although cleared of snow there were icy patches on the track. I could hear the rushing waters of the Allt Mor becoming louder and louder, my hearing sharpened in the darkness, then a wide bridge appeared with a blue rope strung across it. Snow covered it and I could see many footprints. I followed only to come to an abrupt stop on the edge of a dark void high above the water. The bridge was not complete. Whether new or damaged I couldn’t tell but what was clear was I couldn’t go on. Back over the blue rope I skittered down the steep loose bank to the river and boulder-hopped across, my feet getting slightly damp as some of the rocks were under six inches of water, to haul myself on to the snow above the steep farther bank. I hadn’t expected to be fording rivers in the dark, my snowshoes clutched under my arm. The walk had now taken a somewhat unreal air. I’d lost track of the time and seemed to have been in the dark mist-wreathed woods for hours. I knew I couldn’t have far to go yet felt as though I was in a remote wilderness. Eventually a sign appeared pointing back down to the river and to Kingussie. This time the bridge was complete. Up the other side I found myself on the edge of the Kingussie golf course. Again I cast around for a sign or a path. Nothing. Mist drifted over the links. I set off down the fairways, still feeling I was in the middle of nowhere. The golf course seemed to go on for ever. Eventually the club hut appeared and a road and soon my car, an hour and a half later than estimated. 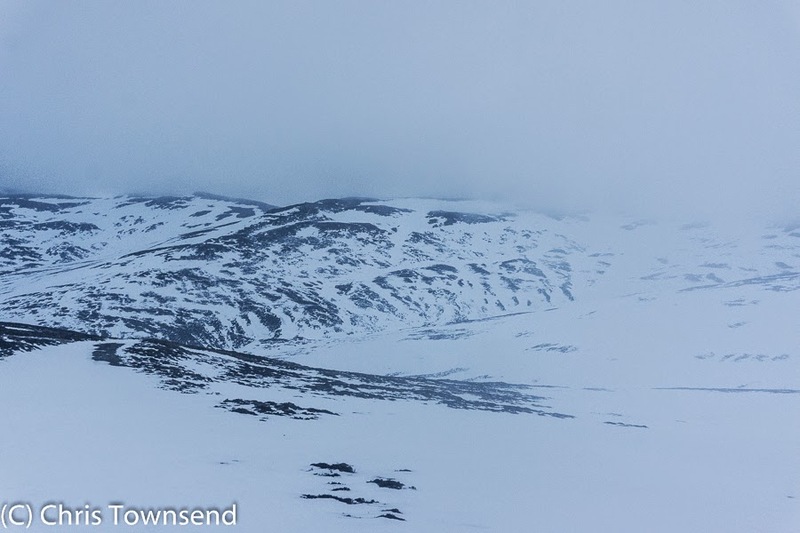 Thick mist, soft snow, broken bridges, confusing tracks – it had not been the easy day I’d been expecting. But it had been much more interesting. Chris, we were in Kingussie in August of last year and heavy rains had taken out quite a few of the paths and bridges in the area just above the town on the western side (including a couple in the vicinity of the golf course). It didn't look like the kind of damage that would all get fixed overnight. A number of paths were temporarily closed off by tape, similar to the stuff police use at crime scenes, and the railway bridge just north of Kingussie station was blocked for a few days by debris brought down by the Gynack burn (a loco had to be brought up from Polmadie to tow the sleeper back south). I think I heard that there'd been some new damage in the area in January. This might explain the obstructions you encountered on your outing. Correction: I should really have said north western side of town. I forget sometimes that the A9 doesn't just run in a straight line due north. Thanks for your posts Dave. I remember hearing about the damage last summer but had forgotten all about it. I should pay more attention to local news!